My husband could eat gravy with pretty much any food. As you can imagine, he was drooling over all the variations of poutine on our 2010 vacation in Montreal. It’s tough to find a restaurant in Montreal that doesn’t sell poutine. For those of you who don’t know what poutine is (you must not be from Canada), it’s basically fries topped with gravy and cheese curds. It’s really big here in Canada and I’d highly recommend you try it! 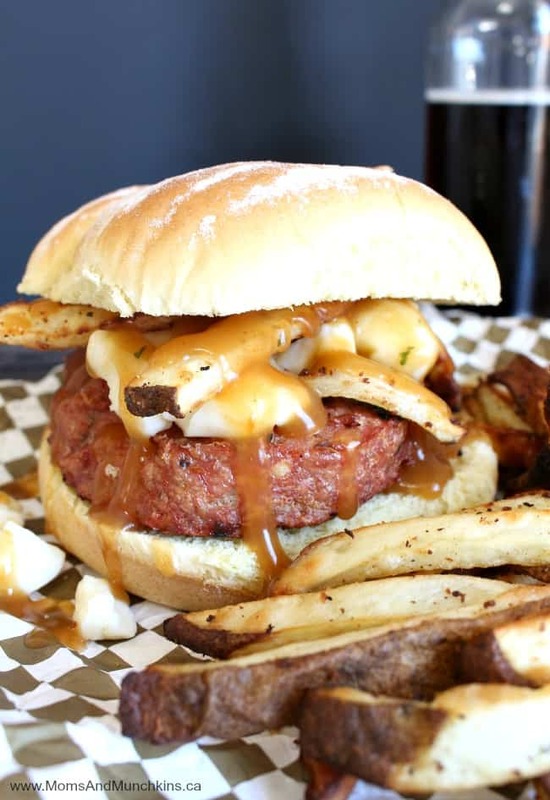 With Canada Day quickly approaching, I created a very Canadian BBQ recipe that’s sure to be a hit with your family this summer – Chicken Poutine Burgers! Why is this recipe so Canadian? Not only does it include delicious poutine but I also used chicken raised by a Canadian farmer. When shopping for food for my family, it’s important for me to know where that food is coming from. If food isn’t properly labeled, it doesn’t make it into my shopping cart. Canadian chicken is raised to world-class quality and safety standards so I know it’s a good choice for my family. Not only is it a healthy choice but I believe in supporting local farmers. Many communities rely on the jobs in the Canadian farming industry. My dad grew up on a farm and I have a few friends who are farmers as well. It’s great to see younger generations continuing the family business or starting their own farming businesses. You can learn more about the farmers in your area here. Why is it important to support Canadian farmers <- here’s a great video explaining several of the reasons! So the next time you’re shopping for your chicken, remember to look for the Raised By A Canadian Farmer logo. Remember to check out the Shopping with Chicken.ca app for keeping your grocery lists organized. Now that school is out for the summer, those stores are getting really busy – the last thing you want to do is make two trips because you forgot an ingredient for your favourite recipe. You can use homemade fries or frozen fries with this recipe. I prefer homemade fries sprinkled with dry ranch dressing and vegetable oil (baked in the oven or in my T-fal ActiFry). We cook the burgers in the BBQ because we love summer grilling! Chicken is an excellent choice for the BBQ. Makes 4 small burgers or two really large burgers. Stir garlic & onion powder into ground chicken. Form burger patties and place burgers on BBQ. Cook until cooked thoroughly. 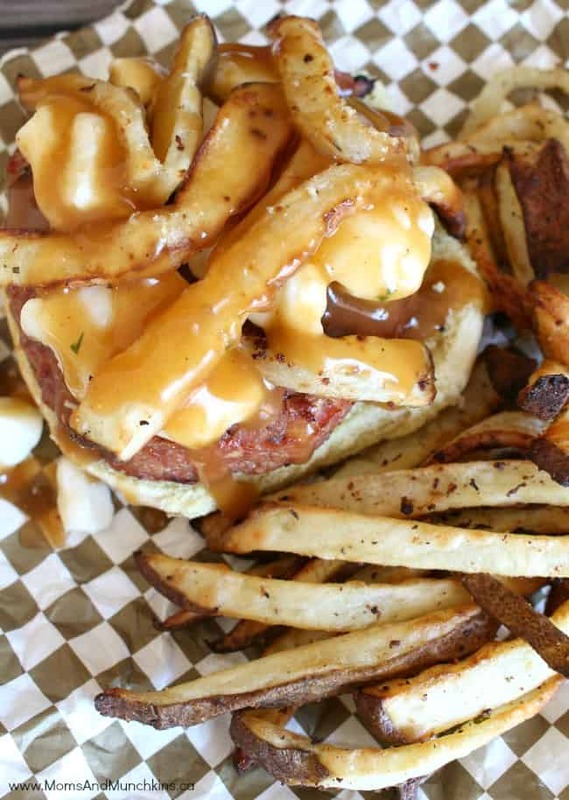 Place chicken burgers in burger buns, top each with cheese, gravy and fries. Have extra napkins handy! Win a $5000 Backyard Makeover! Does your backyard need some upgrades? First I need to clear out all the weeds from my grass, then I need a new backyard swing, some new patio furniture and a big new BBQ. Yes, my list is long! 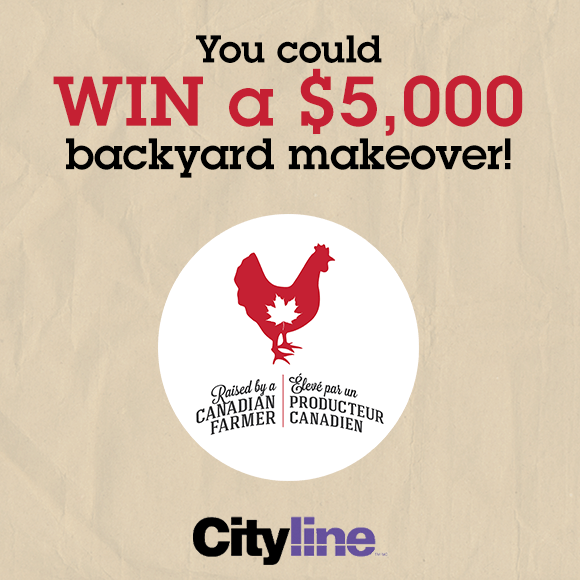 We have an exciting contest to tell you about – you could win a $5000 Backyard Makeover! If you win, I want to see lots of pictures of the “before” and “after”. For more delicious recipe ideas and cooking tips, be sure to follow Chicken Farmers of Canada on Facebook, Twitter, Instagram, and Pinterest.